The Art Tour of Studios and Galleries this past weekend was a cold and rainy event but we did have some visitors who braved the weather to seek us out. It was nice to bump into old friends and catch up. 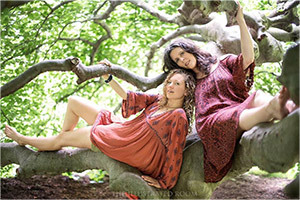 Please view our online calendar for available time slots and email Georgia Griffin at gkg@georgiagriffin.com. 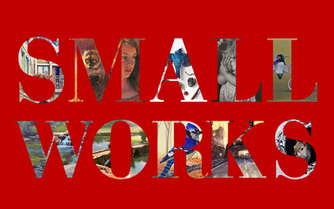 Reminder: Deadline to enter the Small Works Art Show is November 7th! Our last Art Critique will be held Saturday, November 3rd. Register now. 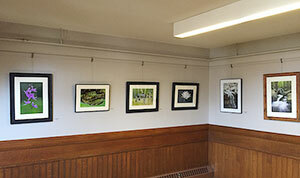 Our current show is the Photography Show and will be up for one more week. Stop by this weekend before it's over. Thank you to all the artists that participated in this show! 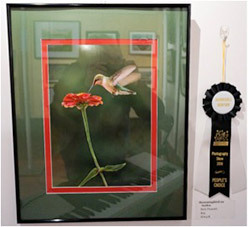 First Place: Deborah Giordano "International Harvester, VT"
Second Place: Charlene Noel "Red Barn with Yellow Flowers"
Third Place: Guy Biechele "A Foggy Morning in Maine"
1st Honorable: Rick Flematti "Hummingbird on Azalea"
2nd Honorable: Susan Ellis "Tenants Harbour Maine"
Looking forward to the next show in November! The date for our Spring Show 2019 will be April 26-28th. Last Critique for the season is this Saturday, Nov 3rd. Register now! Then join us for the next GALA Artists Critique meeting on Nov. 3. Enjoy coffee and conversation. Get some feedback on and insight into what you've created. Please bring two pieces of your artwork, in any medium, finished or in progress, to present to the group. Whether you are a novice or a master, it's always a fascinating conversation when creative minds come together to talk about color, composition, and technique. This activity is FREE for current GALA members! Bring one guest to a meeting for free! 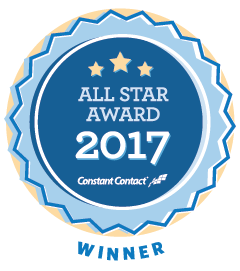 For more information, or to check your membership status please email Deb Giordano. 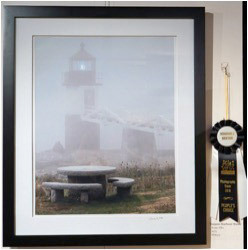 Award winning artists Doreen LaScola and Joe Smith will be displaying their recent works on the walls of the Gardner Ale House from October 4 through November 15. Doreen and Joe are outdoor painting companions, whose idea of a good time is to set up their easels in a garden or a park and paint the day away. Although they are often painting the same scene, their interpretation of it is always very different. While Doreen uses the setting as an inspiration for colorful abstracts, Joe seeks a more realistic interpretation of the scene. 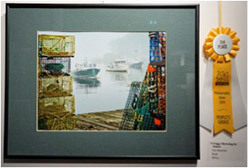 Many of the pieces shown are from local settings such as Otter River, Doanes Falls and Joe's back yard. The Ale House is located at 74 Parker St., Gardner, MA. It is open at 11:30 Monday through Saturday and at 9 am on Sundays. All artwork is for sale. Millers River paintings by Tom Kellner will be on display at the Beale Public Library in Winchendon, MA from now until Nov. 10. An opening reception will be held in the Auditorium on Wed., Nov 7, from 6:30 to 8:00pm. FemLink-Art presents the international video collage "FEMALE" to be screened at Gallery Sitka in Fitchburg on Saturday, November 3, 2018 at 3 pm. 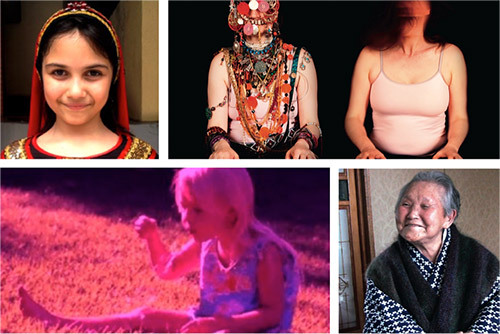 One artist from each country has created a two-minute video in response to the theme "female." Co-curator, C. M. Judge will introduce the video collage and be available for a Q & A after the screening. Admission is $5. Join us for Shop Small Saturday to support small, local businesses like ourselves! 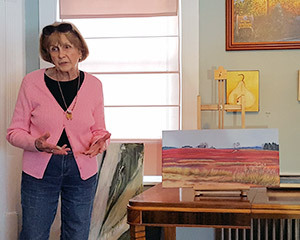 Reflections on Nature is an exhibition of recent work by local members of the EarthSong Artists group, who paint both en plein air and in the studio environment. Eight artists are showcasing their work: Tamara Armstrong Benaquist, Beatrice Corriveau, Barbara Danser, Carol Doleac, Susan Ellis, Mary Kirk, Ilona Kwiecien and Arlene Laurenitis. Exhibition dates: October 14 - November 17. Viewing hours at the Hancock Library are: Monday 2-6, Tuesday 10-7, Wednesday 2-6, Thursday 10-7, and Saturday 10-4. 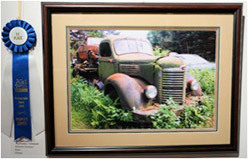 For more information, email bd@danserart.com. In 1968, Jean Tandy founded the Art Department and was instrumental in the design of the Art Wing. It was her vision, and grant writing success, that created this community college art program with facilities and curriculum equivalent to art schools and universities. It was she that hired both Gene Cauthen and John Pacheco. The three of them were an extraordinary team. As active artists and committed teachers, they shared their passion for the arts and built a successful department, gallery and made the art program a cultural center for the community. Each dedicated 30 to 35 years to their students, the department and the college. 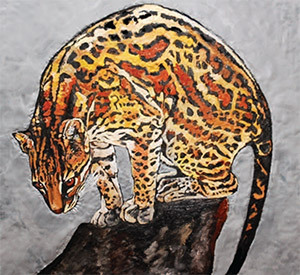 Jean Tandy, an accomplished ceramist and painter, taught ceramics and watercolor painting. 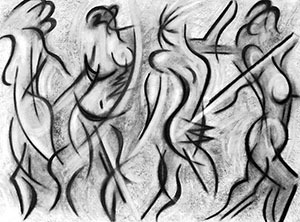 Gene Cauthen, an abstract and figurative sculptor, taught sculpture and bronze casting, design and drawing. 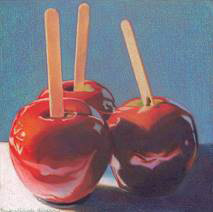 John Pacheco, a realist and abstract painter, taught painting, design and drawing. This exhibition celebrates and honors their dedication and outstanding contribution. It also honors Dr. Samuel O'Neill and Dr. Arthur Haley, past Chair of Humanities and founding President of MWCC. When establishing this college in 1968, it was their endless efforts and profound commitment to education and the arts that made the Art Program, the East Wing Gallery and the Theatre possible. 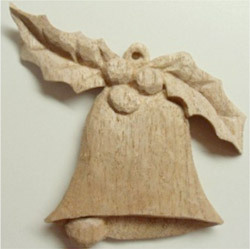 Learn the basics of wood carving and make a delicate bell and holly ornament. Everything will be provided. Arts Alive! 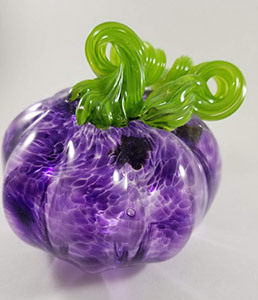 and The Hannah Grimes Center, both of Keene, will continue their Artist to Artist workshop series this fall with a focus on "Deepening the Work" - exploring opportunities for artists to develop and improve their artistic practice and products. The Artist to Artist workshop series is an affordable opportunity for artists, performers, and craftspeople to learn more about topics like how best to use an artist residency, what opportunities a grant can open up for artists, how to share peer critique, and how to ready work for a fine art gallery. Presenters in this series include Virginia Lupi, director of the NH State Council on the Arts who will teach the grants workshop and Craig Stockwell, of NH Institute of Art who will teach the workshop on peer critique. Those interested in the workshops can register online. Registration for each workshop is $10 general public, $5 Arts Alive! members. In this fun and informative workshop students will learn to create vibrant drawings with the simple tool of colored pencils by layering colors, blending, burnishing, and creating rich darks and vibrant colors. Colored pencils are an easy transported medium and can be used for simple sketches to complex layered drawings. In this workshop we will be combining and learning about dry colored pencils with watercolor pencils and how this mixed media approach allows for a quicker build up of color and value. Artists of all levels will enjoy expanding the boundaries of this versatile colored pencil medium. Join a talented artist for a life drawing class using a live model. 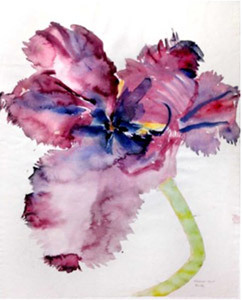 Students will bring their own supplies and draw or paint independently of the instructor. The model will be set up for different lengths of time for various poses. The instructor will be available if help is needed. Completed work will be shown during the last session. Space is very limited. Model fees are included in the cost of the course. 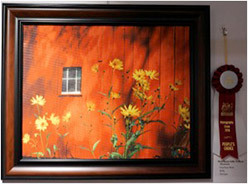 This show focuses on small, original works and items. All mediums are welcome! All work must be for sale. We are seeking paintings, digital art, carvings, pottery, ceramics, ornaments, jewelry, drawings, glass, photographs, artist prints, fiber arts, giclees, cards, sculptures, clothing, books of original writings and poetry, original CDs, and any other artisan made gift items. Membership in PAS is required, but membership dues may be paid when work is dropped off. For more information please contact jean.b.strock@gmail.com. 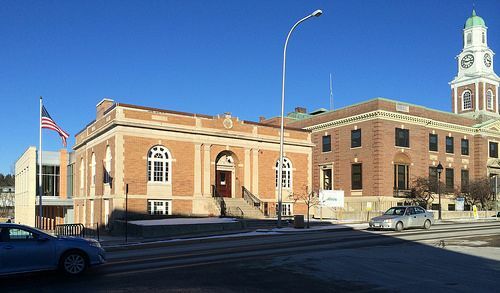 The Jaffrey Civic Center, is located at 40 Main Street, Jaffrey, New Hampshire, parking in rear. 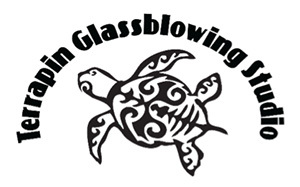 We are a designated 501(c)3 non-profit dedicated to art, education and civic activities. Hours are Monday through Friday, 10 am - 12 noon, 1 to 5 pm and Sat 10 - 2:00. Admission is always free. For more information about us, call 603-532-6527, e-mail us at info@jaffreyciviccenter.com. Find our website, www.jaffreyciviccenter.com, or "Like" us on Facebook. The Amherst Public Art Commission invites area artists or groups of artists to submit work for consideration for exhibition in the Amherst Town Hall Gallery in 2018-2019 (July 2018-June 2019.) Both established and emerging artists are encouraged to apply. 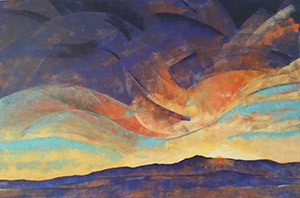 Exhibitions are on display for two months, and artists are asked to participate in the monthly Amherst Arts Night Plus (first Thursday of the month) during their show. Submission requirements: Completed application, artist statement and/or resume, and 5 digital images. A $20 entry fee is payable upon acceptance to exhibit. Applications must be received no later than January 20, 2018. Artists will be notified of the jury's decision by February 5, 2018. The Templeton Cultural Council has set an October 15 deadline for organizations, schools, and individuals to apply for grants that support cultural activities in the community. These grants can support a variety of artistic projects and activities in Templeton -- including exhibits, festivals, field trips, short-term artist residencies, or performances in schools, workshops, and lectures. This year, the Templeton Cultural Council will distribute about $5,500 in grants provided by the state through the Massachusetts Cultural Council. For local guidelines and complete information on the Templeton Cultural Council, visit www.templeton1.org/templeton-cultural-council. Application forms and more information about the Local Cultural Council Program are available online at www.mass-culture.org. All grant applications must be made online by the October 15 deadline.